We are seeking observers to report their sightings of insect pest species that cause harm to forest and agricultural trees. Your observations as part of this campaign will help validate and improve the USA-NPN's Pheno Forecasts, which help managers know when these species are active and susceptible to treatment. You can contribute by reporting observations of key pest species over the course of the year. The campaign focuses on 13 species that are considered to be insect pests. Learn more about these species on the species profile pages and Pheno Forecast pages linked below. 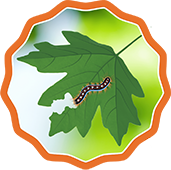 You'll find a phenophase photo guide linked at the bottom of each species profile page to help you with identification of key life cycle events, such as active caterpillars and active adults. Each Pheno Forecast page shows maps of which locations have reached key life cycle event stages this year, and gives information on why managers care about that species. Spotted lanternfly* Lycorma delicatula There is currently no forecast available for this species, but your observations can help researchers to develop one! 1. Select one (or more) species to track from the list of species. To see which species are available in your state, go to The Plants and Animals page, and filter for your state and Pest Patrol Campaign (under the Animal Types dropdown in the Advanced section). 3. Sign up to receive Pest Patrol messaging (in the right sidebar of this page - you may need to scroll back up to see it). You will receive information about how to identify species and phenophases, as well as results of your efforts. You will also receive notifications when your area is approaching the time to look for the activity of pest life cycle stages of interest. 4. Take observations. We invite you to look for pests approximately two to three times a week once you receive the message that your area is approaching the activity period. We encourage you to continue to observe your pest species until it is no longer active. Sign up for Pest Patrol messaging! Sign up to receive messaging for the Pest Patrol campaign. You will receive information about how to identify species and phenophases, as well as see the results of your efforts. You will also receive notifications when your area is approaching the time to look for the activity of life cycle stages of interest. You can earn this badge by making six observations of one target Pest Patrol species within the same year. See it on your Observation Deck.